The classic tailored women's Pearl II in a new colorway! The cut of the gi top features a tapered body and slimmer shoulders. The gi pants have wider hips and the legs are slimmer, tapering toward the openings. Besides the fit of the gi, it also features a lightweight pearl weave, making it perfect to train in during long training sessions in the heat. The Pearl Weave is decked out with high-quality woven patches, custom high-density embroidery, and cool contrast stitching throughout! The jacket is custom tailored with a multi-fabric bottom hem, as well as a reinforced collar, sleeves, and armpits for enhanced durability. The back of the gi is constructed from a single piece of fabric, allowing greater durability, faster drying, and enhanced comfort when fighting from the guard. The gi comes packaged in a large gi bag with the Gracie Crest printed in a matching pink. The Pink Pearl Weave Gi Pants are available here! 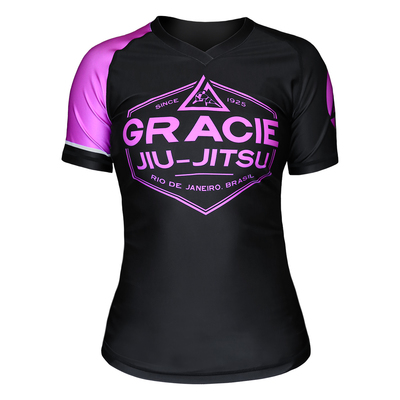 Pink Pearl Weave Gi (Women) has been added successfully to your wishlist. *Sizes indicated are based on the gi AFTER it has been shrunk in the wash. Also, if you're on the border between two sizes, choose the larger size gi. There are currently no reviews for Pink Pearl Weave Gi (Women), but you can be the first!